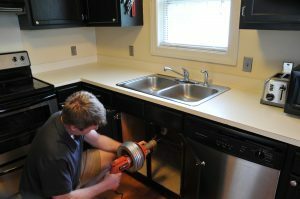 At NuFlow St. Louis, we have invested in modern, effective drain cleaning technology to quickly restore a blocked drain to service or reliably maintain optimum drain function year after year. Our expert technicians are equipped with the right selection of advanced tools that provide the best results at the most affordable rates. There is no drain problem that we can’t solve. Drain cleaning is an essential part of good property maintenance that often gets overlooked. Much like an unwashed car rusts and wears more quickly, a dirty pipe will soon develop rust and corrosion that eat away at the pipe walls, significantly shortening the time before costly replacement is necessary. Drain cleaning also removes the mineral buildup and tree root obstructions that slow waste flow and cause recurring blockages. NuFlow St. Louis has effective tools that clear away all of these troublesome issues and keep your pipes working well for longer. We offer affordable drain cleaning service on a variety of schedules to fit your unique needs and budget. When our customers are dealing with signs that you have an obstructed pipe or a slow drain, NuFlow St. Louis is ready with emergency drain cleaning service to immediately restore your sewer line to their optimal working condition. Our modern technology can easily break up any clog, whether it is a simple paper waste blockage, a foreign object, or a difficult tree root infiltration. Our expert technician will quickly evaluate the situation to identify the right solution and efficiently implement it for professional results. For simple, one-time blockages, our trained technician may recommend our affordable drain cabling service. This tried-and-true mechanical solution uses a chopping head affixed to a long, metal cable that is inserted into the pipe. The technician maneuvers the tool into the obstruction, then rotates the cable to spin the cutter through the clog to grab it and break it apart. The tool is then extracted, bringing the clog material out with it for easy disposal. NuFlow St. Louis always offers hydro jetting service, an innovative drain cleaning solution that uses a powerful stream of clean, clear water to obliterate tough clogs and years of accumulated pipe deposits. The hydro jetting system consists of a highly-engineering spray head connected to a pressurized water tank with a hose. The head ejects water at thousands of pounds of pressure in every direction, literally scouring away pipe debris, including thick tree roots and thick layers of hard water deposits. Such a powerful tool can be damaging in untrained hands, and that is why NuFlow St. Louis only invites the most skilled, knowledgeable technicians to join our team. You can rest easy knowing that your drains will always be thoroughly and safely cleaned. For reliable drain cleaning service that guarantees great results every time, you can count on NuFlow St. Louis. We have the best technology, most skilled technicians, and most friendly staff ready to help you restore a blocked sewer line or plan your regular drain maintenance. Call today to learn more about our advanced drain cleaning technology!